Our slat wall sconce is one of our most popular exterior wall light fixtures. This wall sconce provides an ample amount of light forwards, up and down with little glare due to the placement of the bulbs behind the slats. Glare is my pet peeve! The Slat Wall Sconce is easily customized to fit any space. Consider making it very tall and narrow, or short and boxy. There is a nominal charge (if any) for custom sizes. Additionally we manufacture post lanterns, pendants, flush mount fixtures and mailboxes to coordinate. We can make these high quality custom fixtures in stainless steel or copper with your choice of finishes and diffusers. Located by the ocean? Our solid copper light fixtures hold up well in harsh environments. Can be designed horizontally through custom order. It's been a while since I've had such personal care from a supplier, especially one selling a product I found online. Kent obviously puts a lot of care into his products, but also into the confirmations and correspondence around the orders (we ordered 2 sconces initially, then placed a 2nd order to finish off our exterior). The specific products are his #102 Slat Wall Sconces, and in raw copper and diffused frosted glass they are lovely accents to our contemporary deck home. We'd highly recommend Kent and Lightcrafters. Kent We have had many great comments about the entry lights and driveway pedestal light you all did for us. (Slat fixtures, #102) So, thanks so much for that. Now we are thinking about a sort of matching indoor hall entry light that would hang from a 30’ entry ceiling in the foyer. What would you recommend? Would probably need to be at least 48” high and at least 36” wide or diameter and hung from a single chain. Lightcrafters: A rare find. 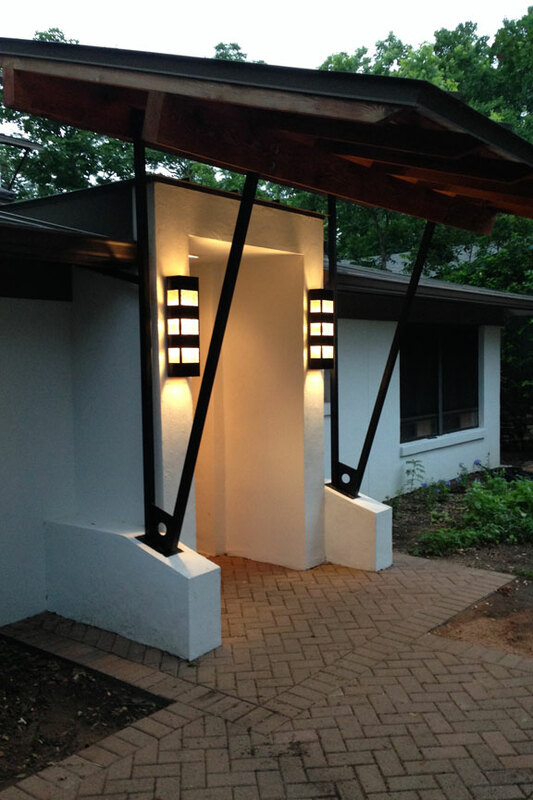 Our modest residential project included interior and exterior lighting. Ultimately, we bought 3 different contemporary styles (Translucent Cone sconce, Floating Glass II, and Flat Slat Sconce). After months of searching local 'custom' shops and online retailers in search of something that "makes a statement"; I found LIGHTCRAFTERS. Website has good level of detail on sizes, options, finishes, customization options. Phone and Email help was very effective and provided for numerous questions on the materials. Kent was always patient with our many questions. I could not be more pleased with the custom light fixtures they created for us. The whole process was great... design help, quality construction, timely delivery, care in packaging and even the price. Lightcrafters is the whole package. Two thumbs way up! I've been using Lightcrafters lighting for the last fifteen years or so and Kent has been great to work with every time! I always get my products on time and they perform well. This fixture, the slat light, is one of my favorites as it is very flexible and timeless. Lots of sizes to choose from or Kent makes me a custom size. Easy! As a builder I look for unique lighting that will accentuate the homes I build, to set them apart and not cost a fortune. Lightcrafters helps me to accomplish this. I can't recommend them highly enough.